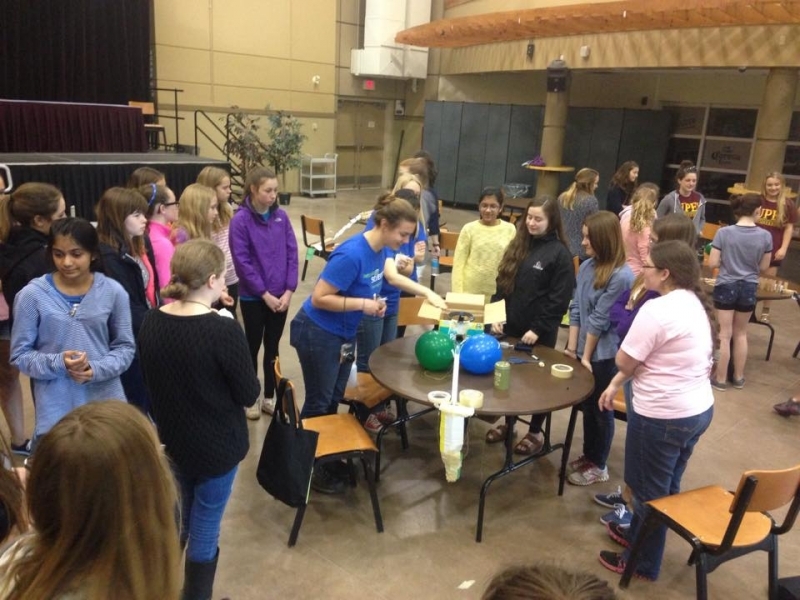 Girls Get WISE Science Retreat! 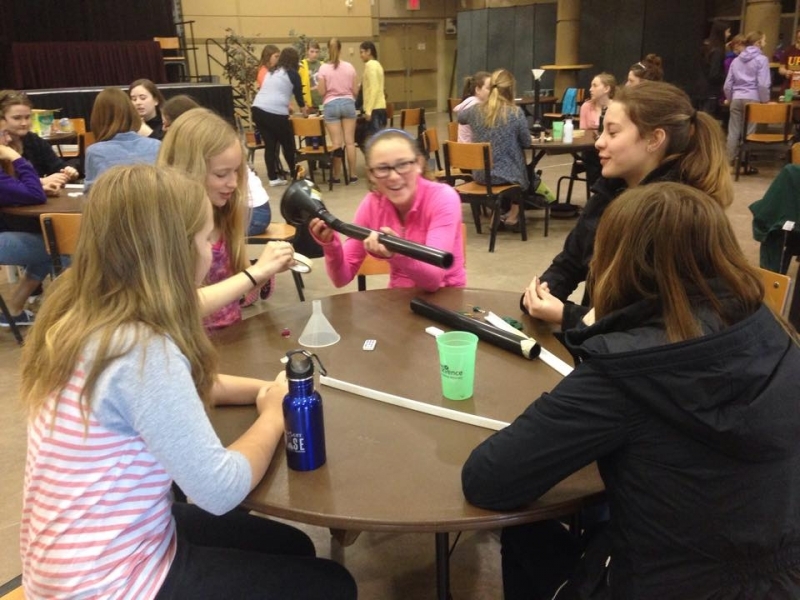 At the second annual Girls Get WISE (Women in Science and Engineering) Science Retreat on Saturday May 23rd, 42 extraordinary girls in Grades 7-9 from around the Island gathered at UPEI to experience science in a hands-on, active learning environment. They started the day with Lets Talk Science building Rube Goldberg machines, taking as many as 10 steps to drop a Lego figure into a cup. Each girl selected 2 items, giving each group 10 randomly selected items that they had to use to design their devices. Like the real world problem solving, they were constrained by the available materials and had to make something fun and fantastic in only 30 minutes. Then they rotated through three different science departments. In chemistry, they did paper chromatography, separating colours in food coloring, making homemade silly putty, and coating test-tubes in silver. In physics, they worked with temperature sensors and experienced the biophysics topic of thermoregulation in humans – measuring the temperature at different points on the body. In engineering, inspired by the quote, ‘The best way to predict the future is to design it’, the girls came up with ways they can ‘design the future’ and performed ideation on the white board walls, researched their ideas, used a computer program to graphically represent the idea, and printed stickers using the vinyl cutter in the FabLab. The girls spoke with mentors who are working or studying a scientific field, giving the girls an opportunity to ask questions about the mentor’s career path or why they chose a specific field. The following organizations sponsored the event: EngineersPEI, ITAP, UPEI, Bricks for Kids, Let’s Talk Science and NSCERC Atlantic WISE Chair, but it was made a success by the professors, students, and professionals who planned and executed the second annual Girls Get WISE event. 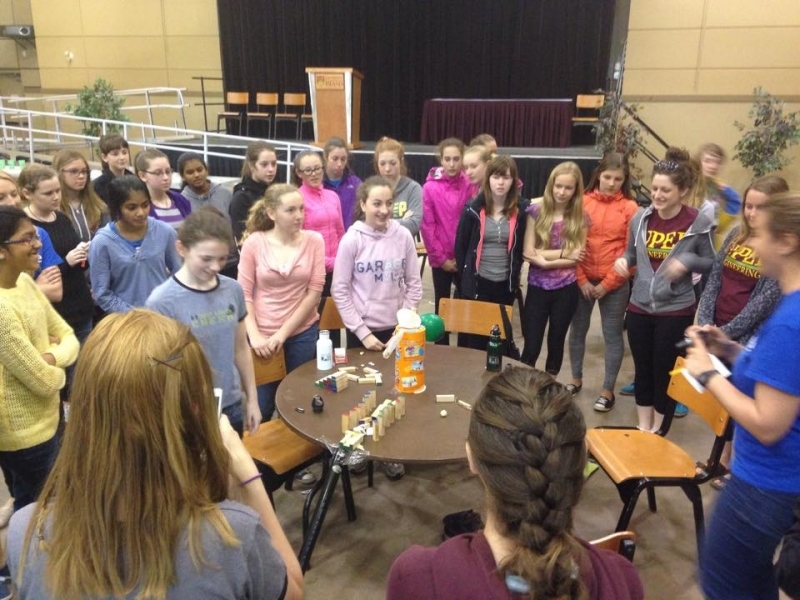 Check out the videos at the link below of Rube Goldberg Machines created by the girls during the Retreat!